Father’s Day is coming up quickly! I am a BIG sucker for top notch dads. My dad has always been amazing. He is super laid back and fun but still strong and disciplined. He is the kind of guy that you can always depend on and he would do anything for his family. Although I spent more time with my mom growing up, I am SO much like my dad. That makes me believe in the power of genetics in a big way. He taught me how to work hard and that struggling builds character and without realizing it, how to be strong. With every big struggle in my life, I’ve relentlessly worked to get through it knowing that it wasn’t so bad because I’d have good character in the end of it all. That has shaped who I am in such a big way. I feel proud to have Johnson blood because Johnson’s aren’t quitters. We are tough, strong and hard workers. I grew up never questioning my loyalty or respect for my father. Just that fact alone makes me feel very lucky. I know it can’t be easy to be a father so to be a great one requires a truly great man. So, I’d like to do something nice for another great dad. Amazing dad’s spend so much of their life working and sacrificing for their family. 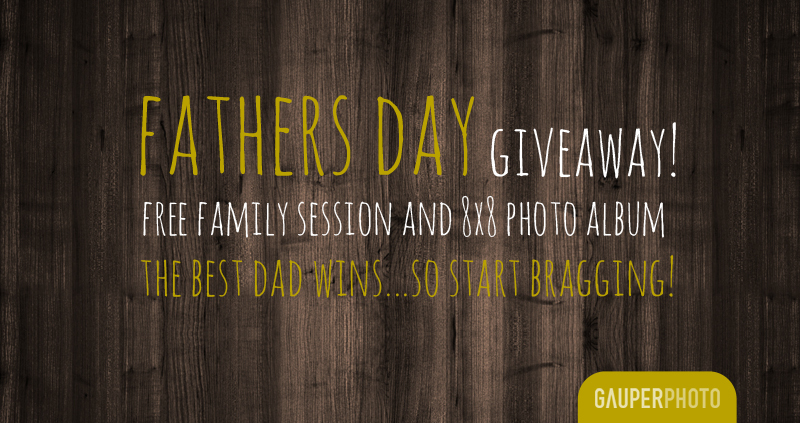 Thus, I’m giving away one FREE family session AND an 8×8 custom designed photo album. 1. You must submit your entry by Father’s day on June 17th. 2. Tell me your story either by email or video. I’m looking for great stories of great men. *The session will be in Kalamazoo or Grand Rapids. If you are from another area, feel free to enter but you will have to travel to come to the shoot.